有关黑暗森林理论的讨论 - 许多人不知道的最可怕的科学理论（四） [美国媒体] What is the most horrifying scientific theory that many people do not know about? Humans do have several physiological advantages in being highly adaptable for just about any climate on earth, being the best at running long distances/migrating, and most importantly having a spare pair of limbs to do tasks, as a benefit of bipedalism. As much as wolves or dolphins are advanced, intelligent social predators, who succeed at the first two, they fall down in sacrificing the opportunity for tool making/dexterity, for increased efficiency in speed/hunting. Is it possible that the emphasis on humans as a predatory species might be over-stated? While the competitive factor is part of our social equation, as expressed by chimps warring with other chimp tribes, it’s also balanced by various pro-social behaviors, particularly at the core of the nuclear family which expands outward in diminishing returns. Possibly, this diminishing empathy over genetic distance increases the Dark Forest theory as aliens are more distantly related than we are to fungi. I think it is dangerous to assume that any alien civilisation that makes contact or actually meets us will be a “wet” lifeform like ourselves. We are not built for space travel. you only have to see how astronauts returning from a stint on the ISS can barely walk for the first few days back in 1G. To travel in space over vast times and distances you need to be a machine, drone, robot with some AI (whatever that means in terms of consciousness). There was a sci-fi film called “Chappie” in which it was possible transfer a person’s “consciousness” into a robot and thereby escape the limitations of DNA based life. A species was using the Dark Forest method. It was hiding. It had previously thought that other intelligent lifeforms in other stars would be friendly but had encountered one that nearly wiped it out. So it hide. But it was recently found by another xenophobic star travelling species and it's home world and all its colony world's have been wiped out. The survivors are now running. travelling in an interstellar ark, a life boat. And the other species is close behind. They land on earth with superior technology and don't want any philosophical discussions because they want to survive. There message to us is, give us your resources, your labor. Because they need to re-arm. To protect against the other species. They try to explain to us humans that we need to devote 100% of our economy, resources, to defenses against this other species and give unwavering help to them to build these defenses. Why would we believe them? So we don't believe them. So they then try to take the resources. A species so advanced to be able to fly across space, perhaps at or close to the speed of light, probably has an army of robots or articifical intelligence available to them. Our production here on earth would be laughable at best, just saying. They would probably have self assembling robots, mass producing and mining planets in superfast speeds. They would send in 100 robots, which would multiply themselves and then turn to harvesting whatever rescource. This I am saying because we are fastly developing 3d printing and robotics. We would be very redundant as would be our planet. It reminds me of the Dutch windmills we still have in many places here in the country, they became vastly redundant with electricity and there is no chance we would use them. If you were lost in a dark, creepy forest at night… would you scream out to alert all the nearby predators where you were? Yes. Every single human would do that. It’s called Fire, and it was one of the things that lead to us being the most dominant lifeform on the planet. The forests aren’t dark, because the humans lit them up. The problem with this theory, is that all of the stealthy soldiers would be killed if one large loud army decided to march into the forest. Stealth is useful to an extent, but no modern military relies on it as their primary defense. Why? Because nothing remains hidden forever, and when you are revealed you must be able to fight and win regardless. If you can fight and win, why bother hiding? If you can kill your enemies now rather than waiting for them to grow in number and strength, why would you not do so? Even if civilizations are fearful, it would take at least a few centuries for any neighboring civilizations to receive any signal from them (and up to 100,000 if they were on the other side of the galaxy) and double that for them to send anything back. If you could build a dyson swarm, your civilizations energy output would be (literally) astronomical. The population you could sustain would be much much higher, and as a result your ability to wage war would be as well. (as well as your ability to defend, since resources like that could be used to spread your civilization out further, offering more protection from extinction). If a species sees you murder humanity in it’s crib, they will know where you are, and that you are violent. Resulting in them killing you. When they kill you, they themselves will be noticed, resulting in other civilizations killing them. With the cycle repeating until all but one is dead, at which point the remaining one quickly claims all resources to avoid new opponents arising, forming a higher level kardeshev civilization. That was an entertaining read, thank you. If everything you just said happened in a couple of cycles over several million years, though, perhaps all of the “old” surviving civilizations would become part of a “Dark Forest” situation, with them all being afraid to spark up another conflict! Except, again, if there are many snipers in the trees, each scared of each other as well as us, that means that when one fires off a shot the other will hear/see it, resulting in them getting shot. And then their shooter will be shot, and so on until there is only one sniper remaining. And if your logic actually made sense, nobody on earth should have ever developed nations. - After all, at one point we were all small groups in the woods. If stalemates like this could last forever, they would have, and we would have never created the larger civilizations we have now. The fact is, they are not stable. Any such system is doomed to collapse in the long term, and the victor would take the territory/resources for their own, making it a poor solution to the fermi paradox. Kidding? If not, what’s your evidence? This was awesome! Thanks for your input! Wow. I can believe that our ability to discriminate a known signal, coming from a known location, will improve vastly as technology progresses. But that doesn’t help much with detecting unknown signals coming from unknown places. There’s some interesting SETI work being done in the field of radio astronomy using machine learning techniques to recognize “interesting” signals as “anomalies”, but such anomaly detection requires identifying what “normal” is, and that’s really hard when you’re talking about noise. That’s a good example of one way we would accidentally make a solution protecting ourselves from The Dark Forest theory. Although we would only be doing it to save on our own energy costs! There is interference from the background noise. The signals we have sent out are simply not strong enough to reach across the galaxy and still retain their original information. This has nothing to do with the receiver, but the medium in which the signal is sent. I have believed in something like the Dark Forest most of my life.We are xenophobic killers who will Nitpick on each other, however I think if we became aware that there was other intelligent life in the universe who presented even the slightest threat to our species as a whole we would band together in an instant and put aside any perceived differences and go after them. An electric arc emits in all frequencies. Listen to your AM when there’s a thunderstorm. But if you have any kind of a machine whose arc is regular and repeated, now it’s obvious it’s not natural. We have been emitting non-natural radiation pulses for almost a hundred and fifty years. Of course, the inverse square law means they become pretty dim and lost in general radiation of the universe. But if somebody had a way of separating the wheat from the chaff. Then there’s radio, radar, television. We’re at the center of a globe a hundred light years in diameter filled with modulated electromagnetic radiation. Sufficiently sensitive receivers which can separate out the background radiation might be possible. It will be fascinating to see the future advancement of our satellite receivers. Perhaps one day there will be a revolutionary invention in that field where suddenly there is a “Eureka!” Moment and we can hear hundreds of ancient radio beacons from around the cosmos. Precisely. Although interpreting them might be difficult. But the point is…we’d know. And how many stars are within one hundred light years of our system? And every year, as the globe expands by one light year, how many more stars are now included? Only if, by pure luck, we happened to guess the right thing to look for. Any non-directional, broad-spectrum listening is going to hear a deafening roar of cosmic background noise within which some puny signal will be lost. Only if you know (somewhat) what you’re looking for, and thus can filter out large portions of everything else, is there even a hope of hearing those signals. You have the same problem the SETI radio astronomy people have: you can’t separate out “background” radiation if you don’t know what “foreground” information looks like. It would be incredible to be one of those archeologists to study the ruins of an extinct civilization! While it’s a terrifying theory, it’s not really a scientific theory. So why exactly is this theory so terrifying to us, right now? Because we have unwittingly broadcast our existence to the Universe for 100 years now! Ever since radio was invented! Every TV Broadcast, every Radio signal, every WiFi connection! Every potential civilization within 100 light years of us could be silently monitoring us, seeing what moves we make, and thinking about how incredibly stupid we are! Em, wouldn’t biologically speaking other civilizations have this too? If our civilization was never careful from evolutionary points, what makes you think others are? People see stars in the sky and think “We can see other galaxies.” But, the light from those galaxies may well be billions of years old. Like everything in the universe, the distances between objects is enormous; even the distance between stars in our own galaxy is many, many light years away. We do not see (or hear) the galaxy as it is, but as it was. Anyone receiving electromagnetic transmissions from planet earth will be hearing them so many years into the future that it probably won’t matter. Ditto for any potential emissions we intercept emitted by civilizations on other planets. Then there’s the problem of space travel. We will never travel in excess of the speed of light; for that matter, we’ll never travel - nor will anyone else regardless of how advanced their civilization might be - at anything near one-quarter the speed of light. And even at those speeds, intergalactic travel would take thousands upon thousands of years (in our measure of time) even if the travellers age at only one-tenth the rate on earth. Doesn’t matter. Intergalactic space travel will, of necessity, involve equipping generations of beings to make the trip, retaining their scientific knowledge (and hopefully increasing it along the way rather than losing it entirely), maintaining the spacecraft and its closed environs along the way, recycling everything on the craft, and hoping that’s both possible and practical. It is very likely that repeated science will eventually become “religion” and thinking will cease as everything reverts to rote, and those points forgotten will be forgotten forever, and eventually the beings will be unable to maintain their closed environment. I have to agree with C Stuart Hardwick. The whole Dark Forest argument fails on multiple points. The likelihood of spacefaring life elsewhere in our galaxy today is so close to nil as to be ridiculous. Even if, by incredible circumstance, such a species did exist elsewhere in our galaxy, the galaxy is so large that it would be many hundreds or even thousands of light-years distant — maybe even on the other side of the core. Our puny signals would not reach that far and likely would be obscured by intervening galactic stuff. Our broadcasts are becoming more and more directed to Earth. Look at cable and fiber for extreme examples. The only really strong signals we send are commands to our probes way out there. they are very focused and unlikely to find their way to extraterrestrials in a few centuries. No spacefaring entities can go very far unless they have lots and lots of power and very, very long lives. Then, they have to find us. Why would they even bother? We have nothing they want. Sure, they may wish to keep us where we are, but that’s it. IMHO, life is common throughout the universe. We may find it on one in every thousand planets, for example. Life that can build spaceships can still be incredibly unusual, and it seems clear that this is the case. Dark Forest probably is a bankrupt theory. There is a possibility, that somewhere in the darkness a big rock accelerating toward us using detachable engine section to eliminate the threat before we can develop similar technology. I don’t know. If I was stalking through this theoretical forest, staying as quiet as possible to avoid detection, and deep in the forest someone is blaring loud music by a very visible campfire…I’d reason that they’ve probably got nothing to fear. In turn, I would give them a wide berth, while still remaining quiet. If the rule is quiet=live, and someone is openly flouting that rule, I’d reckon they’re the most terrifying thing in the forest. Well if you're a Stealth Assassin with a pulse rifle capable of leveling buildings without making a sound… I'd line up a shot or two on him. It may also be the case that life occurs elsewhere but that intelligent life is rare or that communication or travel is extremely slow/difficult even for advanced civilisations. Self-destruction strikes me as unlikely. Even with weapons advancing constantly over the centuries, the world population has grown exponentially. WWII was a major setback and yet made a relatively small dent in the world population. On the universe scale, it might take a million light years to receive light or a signal. You’re looking at history, an event that took place a million years ago. On Earth and nearby objects, the speed of light is perceived as instantaneous. We don’t think in terms of light years. Even in our tiny solar system, if an asteroid hit Mars, we wouldn’t know it for about 13 minutes. That’s why the Mars rover’s landing was not known for about 13 minutes. The Voyager’s signal takes about 20 hours to reach Earth and it’s barely leaving the solar system into interstellar space. Both vehicles were launched back in 1977. The Dark Forest Theory is interesting but it’s a moot point. As we know it, it’s impossible. All this is fun to think about. There is another point that the Fermi Paradox don’t take in account: time. The universe is almost as young as it can be, and still be able to form us. The universe need at least a few generations of stars in order to have enough elements for life to be viable. The earlier this could have happened is around 5bill of years, maybe. But with small chance. It could be argued that other civilizations would go through the stage of radio broadcasting etc. before getting worried about the need to hide. Assuming that any of these broadcasts could be heard that far away into space, and given that the Fermi Paradox is based on the premise of refuting the statistical chance or anomaly of the existence of intelligent life, and if the universe and surrounding universes are filled with an unimaginable amount of intelligent life: Wouldn’t we have captured the broadcast of another intelligent life form? Of course, if the occurrence of life is not as unique as we think it is, and if space is infinite, wouldn’t the “dense forest” really be the “densely populated forest”? If we are to assume that there is intelligent life, with the capability to find and track us, and let’s even assume that they’re close enough to create an effect on human life: Is it not too far a stretch to assume that this theory of predation is too far a stretch? Why do we assume that they would have any interest in eliminating us? This is some sort of Star Wars enthusiasts theory. If we are essentially monkeys on a rock to any outside entity, what interest would they have in us? Finally: Don’t you think the theory that we are entirely alone in the universe(s) is a far more terrifying theory? I think this sort of neuroticism and narcissism (not your’s but the theory itself) is one of the issues with the human race. We have this unquinchable thirst to be desired, to be special. I think it’s funny that we think we’re this interesting to anyone or anything but ourselves. My own conjecture is that the minimum necessary life support system for any organism is the size of a planet. In our case, it's Earth. The reason being that we're inseparable parts of a single living thing, the one living thing on Earth. There's simply no way to peel humans out of our native ecosystem and keep them alive for any length of time. Machines won't make the trip either. They have to be maintained — prevented from breaking down — by living creatures. Us. Left alone over the hundreds or thousands of years it would take to reach the nearest stars, they would irreparably break down. I must say, scrolling down through these comments I was struck by the generally unimaginative and yes, warlike nature of them. 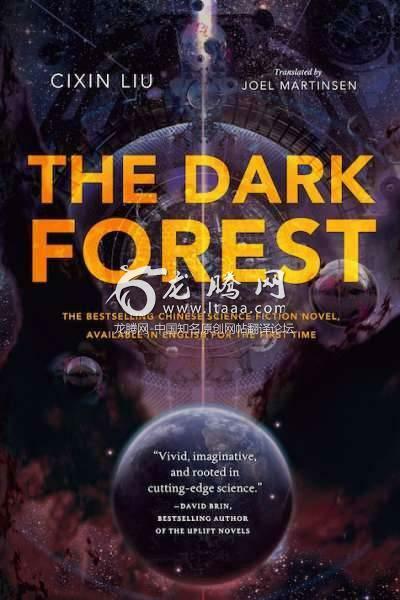 Even the premise of the Dark Forest theory postulates an inherently primitive view of what life is and will inevitably remain. It reminds me of how irritatingly dumb the assumptions of the Star Wars movies are (compared, say, to Kubrick’s 2001). I will grant that from a biological/naturalist point of view yes, everything is hunting and killing everything else, but - and of course I can’t prove this - there may be other “realities.” I won’t go into any spiritualistic mumbo-jumbo, because it will be seen by hyper-rationalists as just that, but I’ll point out that what consciousness itself is, is quite an undecided matter at this point. Just think, you are trying to figure out the deepest cosmic issues with only your logical faculties. Try scanning through these comments. Don’t you get a sense of the human brain sort of splashing around impotently with something beyond its ability to grasp? I don’t mean to trivialize the astonishing accomplishments of science, but we are up against the ultimate paradox here. I’m convinced our thinking needs to travel much farther outside the box than these speculations reach.